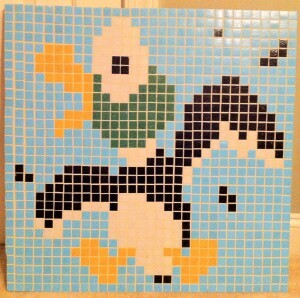 One of two identical duck hunt ducks. They were the second set I made and fall under the “Action” category. The idea was to use these mosaics to capture the really memorable moments from games because they are more evocative than just the sprites themselves. I have both, but one technically belongs to my sister, its just too hard to ship it to LA.